Who were these “enemies” mentioned? Do you think they were genuine in their desire to help build the temple follow God? Why or why not? How did the leaders of Judah reply to them? Why? What authority did they appeal to? What can we learn from here about temptation? Before this temptation came were the people at a spiritual high or a spiritual low? Was the promise made by these people who were attempting to ensnare them believable? How could they know whether it was true or not? Are there any principles we can use to distinguish which things are opportunities and which are temptations? What kind of temptations will you face after reaching a “spiritual high?” How can you have victory? 2 Kings 17:26-34 – The Samaritans superstitious worship. Haggai 1 – A parallel account of the rebuilding of the temple and the time period when the builders halted. 1. In chapters 1-3, the people had great successes. God granted them favor in the eyes of Cyrus, who allowed them to return back to their own lands and returned the spoils that Nebuchadnezzar had captured 70 years before. God granted them favor in the eyes of their neighbors who assisted them by giving them valuables. The people themselves were excited about serving God again. They were excited about building the altar and offering sacrifices in worship. They were excited about celebrating festivals to honor God that hadn’t been celebrated in centuries. They were excited about laying the foundation of the temple. Simply put, they were experiencing a spiritual high. Most of them had probably never felt closer to God than they did right here. But that is when Satan chose to attack. That is when true opposition would begin and their resolve would be truly tested. 2. They were approached with a very reasonable sounding proposition. Their neighbors offered to help them build the temple. Their neighbors wanted to seek the Lord! Just when they thought things couldn’t go any smoother, they received this news. Exciting right? Well, when I grew up I often heard the phrase, “when something is too good to be true, it probably is.” Is this one of those cases? This appears to fit the bill. This offer on the surface sounds good, but when you look a little bit deeper it is clear that there are deeper motivations. b) Chapter 4:1 calls these people the “enemies of Judah and Benjamin.” If they are their enemies would it make sense that they would really want to help? No. They clearly had ulterior motivates. 3. Then what were their motives. The text does not say, but by reading the following passages we can see that they wanted to stop work on the temple. So probably their plan was to sabotage the building. They could do this by stirring up arguments and dissension and division. They could “lose” tools and supplies and equipment. They could “accidentally” forget to tie the ropes of the animals and let them run away, etc. The list goes on and one. 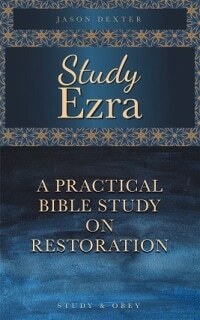 It is easy for us to see their motives considering the following chapters and the context of both Ezra and Nehemiah. But it could have been a bit harder for the leaders who heard them make this offer for the first time. How could they tell it was a lie? 4. The leaders unilaterally rejected the offer to help. They had no interest in working together. This was a wise choice and they probably made it because they didn’t want to take the first step to have an alliance with a group of people who were not truly dedicated to God. This was an attractive offer from a human viewpoint. They could have certainly used the help on this huge project. Also, it would be nice to have some locals who had lived in the area for a long time as allies. To see through this façade took a lot of discernment. Discernment is very important when making difficult decisions like this. All of us face many issues which require discernment. Let’s see what the Bible has to say about this. See cross-references. 5. Application. What lessons can we learn from our life today from this section? When you are experiencing a spiritual high (after a great victory in your personal life or perhaps after a retreat), watch out! Pride goes before the fall. In Philippians 3:12-14 we can see the importance of having a “short term memory” in spiritual things. Do not hold on to and become prideful about successes because each day has its own temptations. If you are living in the past, whether it is celebrating successes or having a self pity party because of failures, you will fail to serve God today. When their first method didn’t work, what did Judah’s enemies do? Does this teach us a wider principle about temptation and/or adversaries to God’s work? What methods did they use to discourage the work? Were these effective? Did the people succumb to these temptations? What methods is Satan using today to try to stop God’s work from being accomplished? Have you ever faced any of these obstacles? How did you/should you respond? Are there any verses from the Bible which can tell us how to respond in these types of situations? 2 Corinthians 12:9 – My grace is sufficient for you. 2 Chronicles 15:7 – Take courage. Your work will be rewarded. 1. When their first method of attack failed, the enemies of Judah tried again. This is another reminder that if you are successful in resisting temptation once, don’t let up. Satan is persistent like a lion so we have to continue to be alert. 2. This time they tried a variety of methods to stop the building of the temple. What methods? Discouraging. How might they have done this? Frightening probably in the form of threats. Hiring counselors against them. In other words they paid off some people to give bad advice such as “wait for better weather,” or “maybe we should consider another site for the temple,” or “let’s do it after the harvest” and so on. They were very persistent. They continued trying to frustrate the plans to rebuild the temple (and later the wall) throughout the reign of at least four kings. a) Application: Satan normally doesn’t change his methods. He keeps using the same ones again and again because they are successful. He may use each of these three ways to try to keep us from doing God’s will today. Can any of you give examples of how you have been discouraged from doing God’s will? Frightened? Had people counsel you against it? Let’s take a look at some verses which may help us to know how to respond to adversity. 3. We will see later in verse 24 that they were successful and the people did finally give up building the temple for a period of time. No one is immune. Everyone is susceptible. The Jews were so excited to be back in Jerusalem. They were excited to be serving God. But they allowed external pressures, opposition, and adversity to hinder them from doing God’s will. See Haggai chapter 1. Four kings are mentioned in this chapter (Cyrus, Darius 4:5, Ahasuerus 4:6, Artaxerxes 4:7, 11, 23, Darius 24). How does this chapter fit within the historical timeline? What was the purpose of this letter to the king? How did they describe Judah and the people who lived there? Did the writers really care about the king’s revenue (13)? Do you think the writers really cared about the king’s honor as they claimed (14)? Then why did they say those things? Would you say that their accusations were accurate? Which ones were true and which ones weren’t? How can we respond if people slander us? 1. Verse 6 brings up a bit of a sticky problem. Notice that verse 5 mentions Cyrus and Darius. Verse 6 mentions Ahasuerus. Verse 7 mentions Artaxerxes. Verse 24 again mentions Darius. It appears at first reading that the people write the account jumps from Cyrus/Darius to Artaxerxes who commands the building to be stopped (21) and then it is stopped in the time of Darius, who reigned BEFORE Artaxerxes! This obviously is impossible (the people in the time of Darius couldn’t stop working because of a letter written many years later). Therefore there must be another explanation. 2. The most probable explanation I have seen is that verses 6-23 are something like an attachment or supplement material. During these verses, Ezra jumps off of the chronological timeline and includes an anecdote fitting with the THEME (but not timing) of opposition from his own time. This makes sense when you look closer at the text. What are the people referred to as building in the letter to Artaxerxes? They are reported to be building a wall (verse 13). There is no mention of a temple. The thought process (of their enemies) is that this wall would lead them to rebel because of the protection of the wall. A temple wouldn’t lead them to do this. Artaxerxes also responds to the issue about rebuilding the wall in verse 21 and commands them to stop. It is not referring to the temple, but the later event recorded in Nehemiah about the opposition to the wall. This reinforces the theme which Ezra wants to highlight and that is that there is extensive opposition to the work throughout the whole process of rebuilding the city. If you read from verse 4-5 directly to verse 24 skipping the supplemental segment it would read like this: “discouraging…frightening…hiring counselors… all the days of Cyrus king of Persia, even until the reign of Darius…Then the work on the house of God in Jerusalem ceased, and it was stopped until the second year of the reign of Darius.” In other words the building of the temple ceased (notice that it is not being forced to stop in 24) because of the opposition of Judah’s enemies which is taking place in verse 4. 3. The tone of the letter is flattering and slanderous. a) Flattery: The writers pretend to truly care about the king’s revenue and his empire. This is a common method for people to try to manipulate others. They had their own motivations which were mostly hatred for the people of Judah. See cross-references about flattery. b) Slander: Many of the things they said about Judah were not true. The people there were not plotting to revolt. This was another lie told intended to stir the king up to stop them from the rebuilding project. We cannot control what people say about us, only how we live and how we respond to those comments. In some cases if people slander us, we can set the record straight. In other cases, we can’t. The only thing we can do is to make sure the thing they are slandering us about is false. See cross-references. c) Sinful people do not play fair. This is one reason that Christians are at a competitive disadvantage in many areas of life including education (we can’t cheat) and business (we can’t be corrupt or take bribes). This has led some professing believers to give up following God and instead take the easy road. But we shouldn’t forget that if we are obeying Him, God is on our side. He will take care of us and ultimately give us the victory. How did the king reply? Why did he listen to them? Since the people were doing good work and serving the Lord, why do you think God allowed this to happen? If you are following God in your own life, will your life always be smooth? Where might you meet opposition? Why might God allow this to happen? 1. Predictably, the king listens to them. He cares more about his own empire than the truth. As a result, he issues a decry for the work to be stopped. We should make sure that we don’t make decisions like this king, but that we instead try to hear from BOTH sides before making a decision. Don’t allow people to flatter and manipulate their way into getting us to do what they want. How can this verse fit with the chapter since Artaxerxes reigned after Darius? If 6-23 is taken as an addendum or supplemental material (for showing more about future opposition), then in chronology verse 24 follows which verse? So then what is the reason the people stopped in verse 24? Would you say they were right or wrong to stop because of what we see happening in verses 4-5? How does this compare with their attitude in chapter 3? Is there anything you can learn from the failures of the people to finish (quickly) what they started and keep serving God no matter what? Hebrews 12:1 – Run with endurance the race that is set before us. 1. The people gave in to the threats and discouragement back in verses 4-5 and stopped the work that they had begun so excitedly. They allowed the opposition to win. They allowed Satan to stop God’s work. Borrowing a New Testament parable, they appear to be like the seed that was on the rocks. This represented people who excitedly respond to the gospel but fall away when a trial comes. History tells us that the work was stopped for sixteen years before they started again. And during those 16 years we learn from Haggai that the people were mostly concerned with their own interests such as farming and business, etc. a) Application: What application can we make from this? We should be persistent in the face of trials. We should rededicate ourselves to finishing the race by making the right decisions to serve God every day. Do not dwell on past successes. The Christian life will not be easy. There will be trials. There will be adversity. How will you respond when it comes?